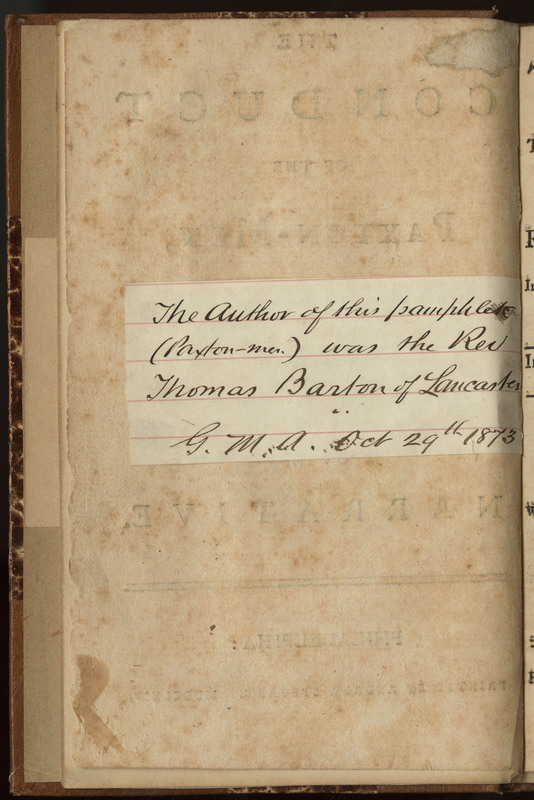 The most popular author in this Paxton archive is Anonymous. Alongside pseudonyms like "Pennsylvania," "Philalethes," and "Philanthropos," Paxton critics and apologists often published materials without any attribution in order to avoid public scrutiny or reprimand. 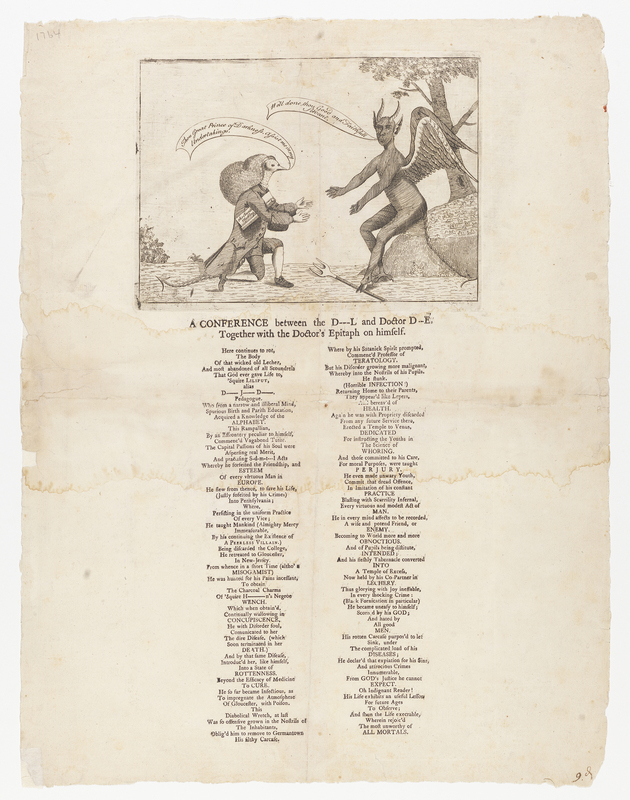 Indeed, this archive features nearly two dozen pamphlets and political cartoons published without any attribution, including popular materials such as A Battle, A Looking-Glass, and A New Song in High Vogue in Northampton County​. Elsewhere, historians and archivists have labored to discern authorship by examining biographies, correspondence, and deconstructing stylistic features that reveal an author's hand. This essay seeks to use Thomas Barton's The Conduct of the Paxton Men, Impartially Represented as one such case study. However, unlike other pamphleteers who chose to mask their identities for personal reasons, Barton was coerced into a political role that he must have loathed. 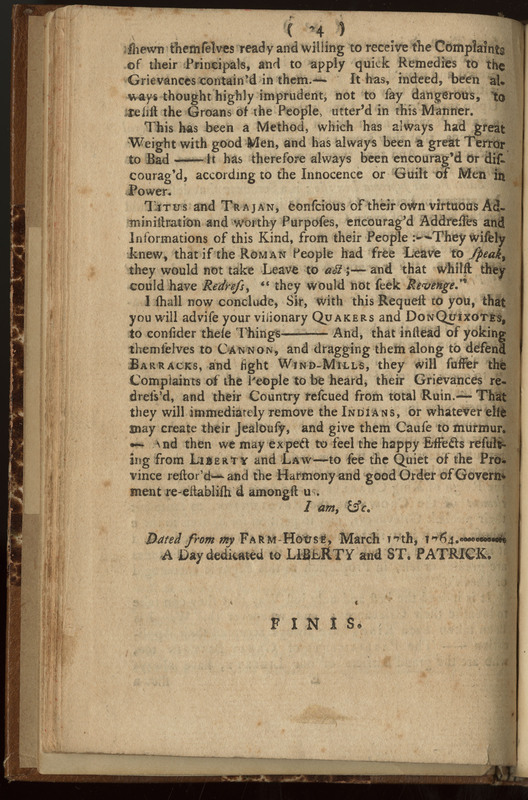 Printed in Philadelphia in 1764, The Conduct was written partly to rebut Benjamin Franklin's anonymously published attack on the Scots-Irish instigators of the Paxton Boys' disturbances, A Narrative of the Late Massacres. 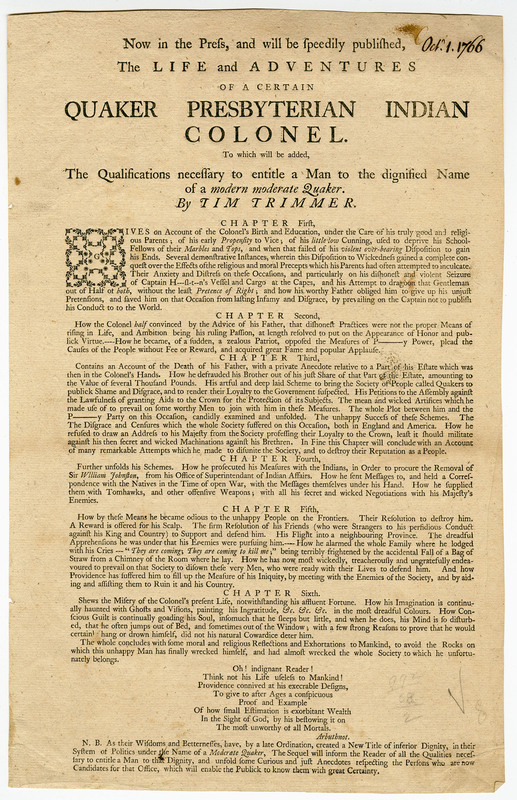 Accordingly, The Conduct sought to justify and defend the actions of the (largely Scots-Irish Presbyterian) Paxtonians, to impugn the motives, pacifism, and inaction of the Quaker-dominated General Assembly, and to discredit the reputation of the murdered Conestoga Indians. Although the pamphlet's title page does not identify an author, it is generally accepted that the Rev. Thomas Barton, itinerant Anglican missionary in Lancaster, wrote The Conduct. This attribution, however, contradicts all that we know of Barton's previously expressed feelings about the Scots-Irish and the Native Americans. Why would he precipitously betray his mission? The probable answer is that the Penn proprietary (Pennsylvania's executive arm) and the Scots-Irish, long at odds with one another, found common cause in checking the legislative power of the Quakers. Lest he betray the government's strategy, however, Barton had to write as someone other than the most eloquent and literary Anglican divine then in the colony. Anonymity also assuaged his personal scruples. Barton succeeded in remaining unknown. Although some might have suspected Barton's hand, his authorship remained secret until his own great-great-grandson, George Maurice Abbot, identified him in 1873. Notwithstanding Abbot's attribution and the scholarly agreement accorded it, a careful reading of the tract, set against what can be established of Barton's life and outlook, raises significant questions. Why would Barton, whose correspondence consistently expresses aversion to both mob rule and overly assertive dissenters, especially New Side Presbyterians, advocate the cause of largely Scots-Irish Presbyterian vigilantes? A missionary committed to Christianizing and educating the Native Americans, moreover, Barton would seem an unexpected apologist for the slaughter of twenty baptized Conestogas peaceably settled on a reservation near Lancaster. If George M. Abbot had known of a family tradition identifying Barton as the author, that tradition would most likely have derived from Abbot’s great-grandfather and Thomas's eldest son, William. Yet William, eight years old at the time of the December murders, never once alludes in his biography of his uncle, David Rittenhouse, to his father's attitude toward the rioters (William Barton 146-50). 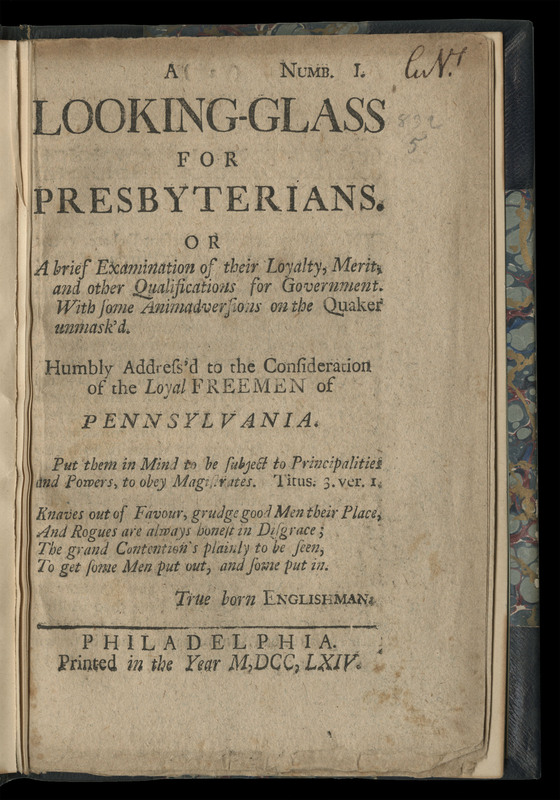 William expends over three pages on the disturbances themselves without referring either to his father's contemporaneous preaching in Lancaster or to his supposed authorship of the tract. Either William Barton knew nothing of his father's relationship to the Paxton affair, or, more likely, he suppressed the information. Another factual challenge to Barton's authorship comes with the pamphleteer's teasing reference to his residence: "Dated from my FARM-HOUSE, March 17th, 1764." Barton did not reside on or own a farm in 1764. It was only after 1768 that Barton began to cultivate what appears to have been his first and only farm in Lancaster county, ironically located on the Conestoga Manor (Klein and Diller 30-32). This reference thus needs to be understood as a further attempt to mislead the reader. Thomas Barton's known attitudes also don't align with the pamphleteer's expressed feelings toward the Paxtonians and the Indians. At least one contemporary polemicist perceived that The Conduct was executed in a spirit far from the title's self-publicized impartiality, so shrill was its defense of the rioters and its vilification of the Indians (An Answer to the Pamphlet Entitled "The Conduct of the Paxton Men"). In his introduction, the anonymous author of The Conduct pointedly disavows having any "political Ends to serve . . . [and] nothing to hope or fear from Party Connections." Professing objectivity, he pointedly dissociates himself from any incendiary or insurrectionist impulse, unequivocally repudiating vigilantism: "Such violent Steps can never possibly be productive of any thing, but WILD UPROAR and CONFUSION." He swears "to bear his Testimony against, and to discountenance by every Means in his Power" whatever might offer "the least Insult to the LAWS and GOVERNMENT of his Country." "As might be deem'd..." – the Paxton Boys only appeared to defy the state. What has been popularly interpreted as rebellion actually laid "bare the PHARASAICAL BOSOM of QUAKERISM, by obliging the NON-RESISTING QUALITY to take up Arms, and to become Proselytes to the first great Law of Nature." The perceived indifference of the Quaker faction to the frontiersmen and its protection of the Indians, on the other hand, invited condemnation. By insisting that important political and ethical differences separated the proprietary from the assembly, the pamphleteer denies accusations of sedition. Perhaps the most telling argument against Barton's authorship, however, rests upon the pamphleteer's unmitigated hatred for all Indians. Throughout his entire missionary career, Barton distinguished between hostile and "friendly" Native Americans. Generally, he criticized those allied to the French and eager to attack the British settlers. "Barbarous Savages," "the rude Spoiler," "Heathens or Infidels," "Barbarians," "a Cruel Enemy" – these are the more common nouns and adjectives he uses to describe the hostiles (Thomas Barton to William Smith, 28 October 1755; Thomas Barton to William Smith, 2 November 1755; Thomas Barton to Richard Peters, 5 July 1763). More typically, however, Barton viewed the proposed beneficiaries of his missionary activities with a mixture of condescension and compassion—"poor ignorant Creatures," "tawny People," "miserable unenlightened People," "barbarous Nations who are immersed in the grossest Idolatry," "those poor Heathen who 'sit in Darkness & the Shadow of Death,'" and "rude & barbarous creatures" (Thomas Barton to the Secretary, 8 November 1756; Thomas Barton to the Secretary, 28 June 1763; Thomas Barton to the Secretary, 6 December 1760; Thomas Barton to the Secretary, 23 January 1766). In one 1764 report, he praises his congregation for having had no part "in the Murder of the Indians in this Place and the different Insurrections occasion’d by this inhuman Act" (Thomas Barton to the Secretary, 16 November 1764). 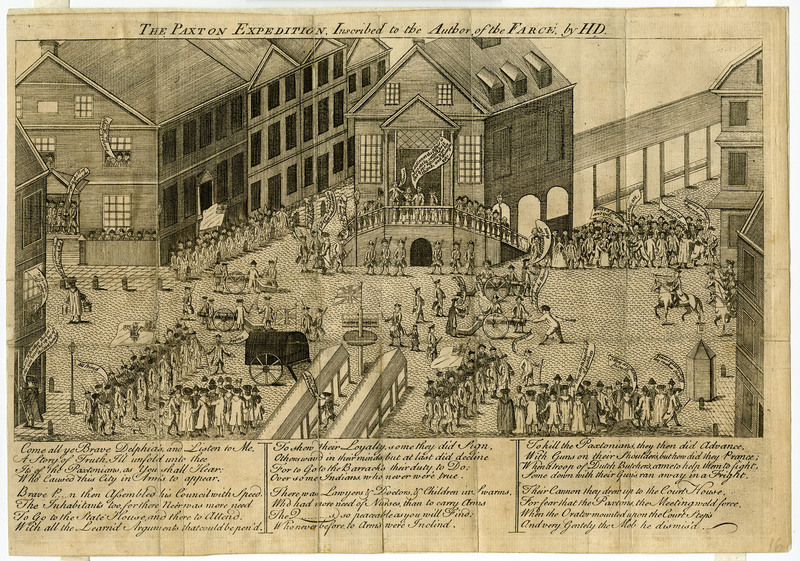 He also castigates the Paxton Volunteers in a letter to Sir William Johnson when he refers in passing to "the Assassination of those hapless Wretches" (Thomas Barton to Sir William Johnson, "supposed May 1763"). While it is difficult to square Barton's sympathies for improving the Indians' conditions with the pamphleteer's naked hatred of baptized Conestogas, the pamphlet's epistolary form, distinctive prose style, and rhetorical duplication of an earlier Barton tract—combined with external evidence—suggest that Thomas Barton was, in fact, the author. In addition to combining an apology for the Paxtonians with a polemic against Franklin's Narrative, The Conduct relies upon the convention of the letter. 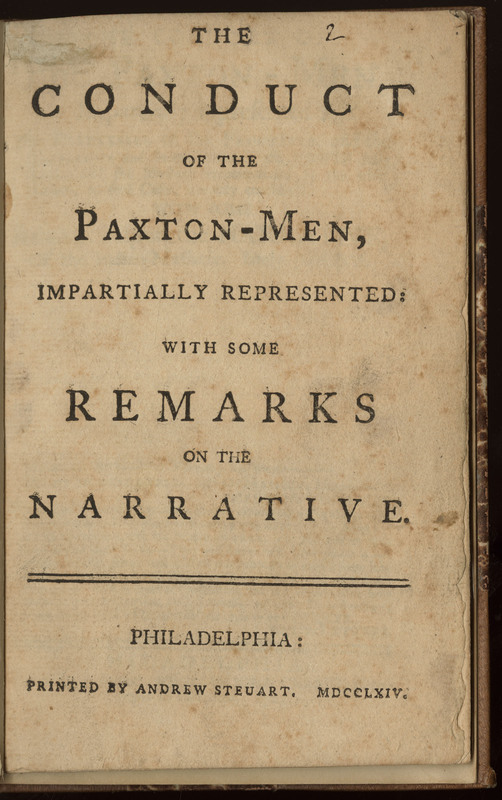 Both the title page and the initial headnote claim to be "A LETTER from a GENTLEMAN in one of the Frontier-Counties, to his Friend in Philadelphia, relating to the Paxton-Men." Barton's brother-in-law, David Rittenhouse might well have been that "Friend in Philadelphia." While the addressee is forgotten once the essay gets fully underway, in one notable passage the author implies that his missive should correct his friend's ignorance of frontier life. The pamphleteer writes: "I am no Stranger to your Fellow-feeling and Humanity:- I well know that you have a Tear for Distress, and a Sigh for Misery." He then diplomatically reminds his friend that "if it were not criminal, I should envy you your happy Lot, in being placed by Providence at some Distance from the Scenes of Destruction and Desolation, of which, I and my Neighbours have been Melancholy Eye-Witnesses." With that, he elaborates a full page of graphic description of recent atrocities enacted in the backcountry. 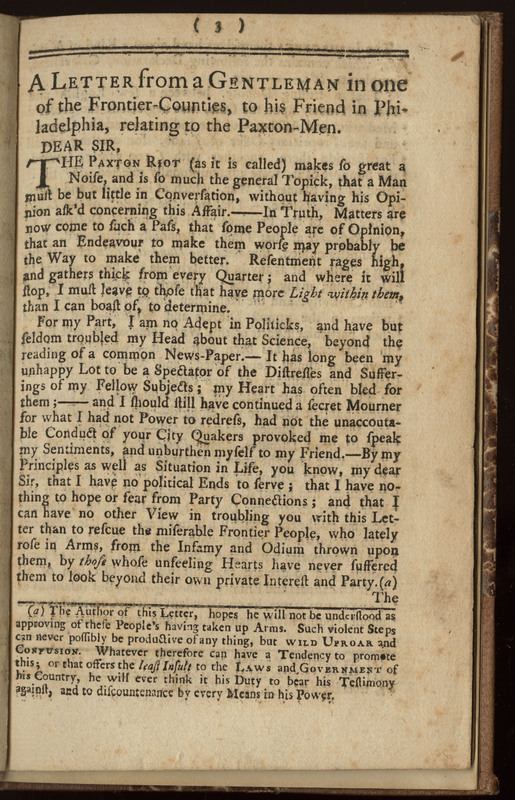 If the apologist is to be believed, he wrote his letter on 17 March 1764, one month following Rittenhouse's epistolary condemnation of the Paxtonians' march on Philadelphia. William Barton does not quote Rittenhouse’s letter in full, his purpose being to illustrate that his uncle "was zealously disposed to support the legitimate authority of the government, in order to suppress illegal and disorderly proceedings, subversive of the laws and dangerous to the public peace and safety" (William Barton 147). Because the actual Barton/Rittenhouse correspondence has been lost or destroyed, we cannot examine whatever letters Barton may have penned to Rittenhouse on this subject. 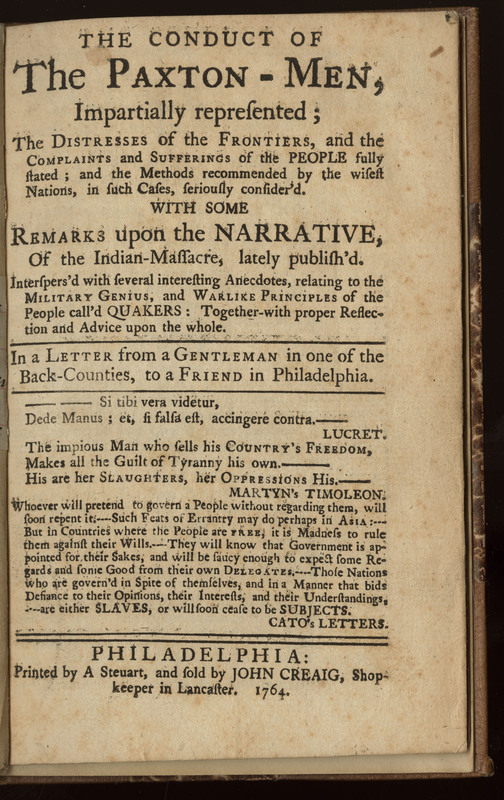 One thing about the pamphlet is nevertheless clear: it was written in part to defend the actions of a people who felt that government apathy had abandoned them to Indian savagery and to exonerate the backsettlers from such criticism as Rittenhouse expressed in his 16 February letter, when he wrote: "I have seen hundreds of Indians travelling the country, and can with truth affirm, that the behaviour of these fellows [the Paxonians] was ten times more savage and brutal than theirs" (William Barton 148). Not unlike handwriting, style reveals evidence of identity, even in instances where an author might try to alter it. 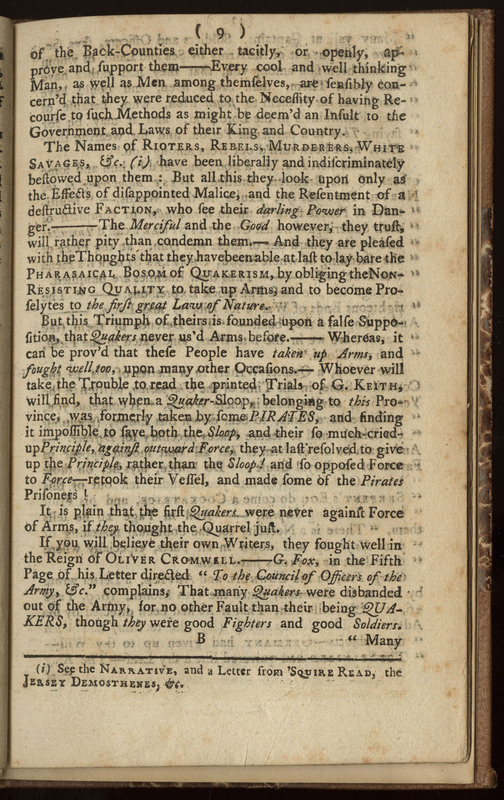 Barton's annual epistolary reports to the Anglican church, war journal, and the exhortation Unanimity and Public Spirit all disclose what might be described as eighteenth-century journalistic style: Barton's prose stands out for its energetic, spirited, if at times glib, "flow"; its numerous parenthetical, interruptive, and exclamatory statements; its predilection for paired synonymous, often alliterated nouns, and for paired adjectival, over adverbial, modifiers; its frequent use of the figures of speech metonymy and synecdoche in emotionally stressful descriptions. Perhaps reflecting the fast pace of his writing, Barton reveals a fondness for the dash or the dash combined with a period to mark a sentence's end. Any or a few of these would scarcely serve to particularize Barton's prose, but combined with one another and set forth with rhythms and cadences as distinctive as the grain patterns that distinguish oak, cherry, maple, or walnut, his style announces itself readily. One of Barton's favorite figures of speech involves a synecdoche employing images of the wounded or bleeding heart and blood/bleeding. It invariably occurs in his descriptions of Indian atrocities and of his reactions thereto. In a 8 November 1756 annual report to his superiors, he writes: "my Heart bleeds in relating what I am an Eye Witness to" (Thomas Barton to the Secretary, 8 November 1756). He tells Thomas Penn that "My Heart bleeds for the poor People" (Thomas Barton to Thomas Penn, 7 April 1758). The author of The Conduct expresses himself similarly: "My Heart has often bled" and "what good Man is there, whose Heart does not bleed . . . ?" Barton uses personification to express the magnitude of suffering in the backcountry: "our bleeding Country"; "their bleeding Country." (Thomas Barton to the Secretary, 8 November 1756; Thomas Barton to Richard Peters, 5 July 1763). Similarly, The Conduct's author rebukes the Quakers "who have so long suffer'd the Province to bleed beneath the Savage Knife." The image of fire offers another powerful symbol of backcountry warfare. In one letter, Barton describes the country's seeming "to be one general Blaze” (Thomas Barton, Pennsylvania Gazette), anticipating the pamphlet's "all burnt to Ashes in one general Flame." This phrasing echoes similar descriptive usage elsewhere: the pamphlet's "their Country rescued from total Ruin" and an earlier letter’s lament that all is "ready to sink together in one general Ruin!" (Thomas Barton to Thomas Penn, 28 February 1757). The author of The Conduct shares with Barton a fondness for doubling adjectives and descriptive nouns to heighten emphasis. Compare the following characteristic examples from the pamphlet and Barton's earlier writings. The Conduct: "Distresses and Sufferings ... Infamy and Odium ... WILD UPROAR and CONFUSION"; "Lenity and Mercy"; "meek and peaceable . . . Protection and Security ... Vengeance and Destruction"; "Noise and Hubbub"; "Vassalage and Slavery"; "Ruin and Desolation"; "Cruelty and Inhumanity"; "LAWS and MAGISTRACY"; and "LIBERTY and FREEDOM." Barton's earlier works: "The general Cry & Wish is for"; "Miseries and Distresses"; "Beggary and Despair"; "Objects of Charity and Commiseration"; "Sighs and Groans"; "calamity [SPACE] and distress"; "dangers and trials"; "barbarous and cruel"; "Hardships or Distresses" (Thomas Barton to Richard Peters, 5 July 1763; Thomas Barton, Pennsylvania Gazette; Thomas Barton to the Secretary, 8 November 1756; Thomas Barton to Thomas Penn, 28 February 1757). Barton and the author of the pamphlet also like to alliterate their doubled nouns and modifiers. A sampling from Barton's known works: "Cries & Confusion"; "the Pulpit & not the Press"; "sudden and savage Death"; "Division and Distinction"; "Advice and Assistance"; "Grand & Glorious work"; "Danger & Distress"; "an Interest with, & an Influence upon"; "all Health & Happiness" (Thomas Barton to William Smith, 2 November 1755; Thomas Barton to William Smith, 28 October 1755; Thomas Barton to the Secretary, 8 November 1756; Thomas Barton to Thomas Penn, 7 April 1758; Thomas Barton to Richard Peters, 11 April 1758; Thomas Barton to Richard Peters, 18 July 1758). Even though The Conduct's author shows a greater inclination for simple descriptive, often redundant, doublets, he also employs alliteration to achieve added emphasis: "Application and Addresses"; "drunken, debauch'd"; "Discord and Dissention"; "Gallows or the Gibbet"; "Honour and Hospitality"; "Destruction and Desolation"; "lawful and loyal Methods"; and "QUAKERS and DON QUIXOTES." Barton's frequent use of the verb and the verbal noun groan finds its parallel in the pamphlet. Compare "groaning under a burden"; "miseries they now sadly groan under"; "calamities under which they have groan'd"; "Signs and Groans" (Thomas Barton to the Secretary, 8 November 1756; Thomas Barton to the Bishop of Oxford, 12 March 1757; Thomas Barton, Pennsylvania Gazette) with the pamphlet's "Groans of the People." Stylistically, Thomas Barton and the writer of The Conduct favor recurring figures of speech, synecdoche, and metonymy. The two authors also show a predilection for the epistolary form. And both rely upon a specific, common vocabulary and rhetorical strategy. Less open to analysis is the similar rhythm, cadence, and syntax that characterize each as journalistic at times, and hortatory at others. Finally, on an admittedly subjective level, reading passages from Barton and The Conduct aloud physically reinforces the sense that we are, in fact, reading the same writer. 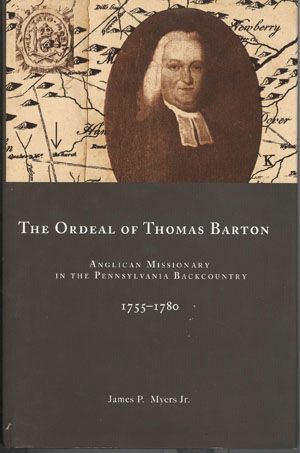 This essay is based upon James P. Myers's chapter "A Stark Naked Presbyterian," in The Ordeal of Thomas Barton: Anglican Missionary in the Pennsylvania Backcountry, 1755-1780 (Lehigh University, 2010). To learn more about Myers, visit the Creators page. H. M. J. Klein and William F. Diller, The History of St. James's Church (Protestant Episcopal), 1744-1944 (Lancaster, 1944). William Barton, Memoirs of the Life of David Rittenhouse (Philadelphia, 1813). Thomas Barton, Pennsylvania Gazette, 28 July 1763, no. 1805. Thomas Barton to the Bishop of Oxford, 12 March 1757, transcription, Miscellaneous File, no. 15212, York County Historical Society, York, Pennsylvania. 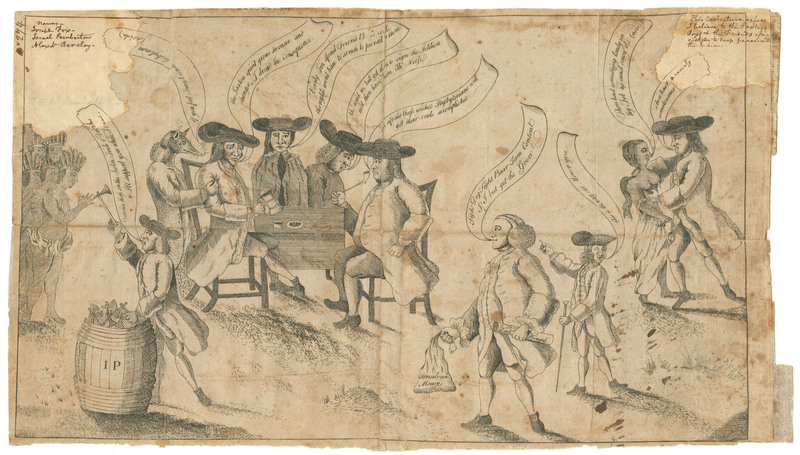 Thomas Barton to Richard Peters, 5 July 1763, Peters Papers, 6:10, Historical Society of Pennsylvania. 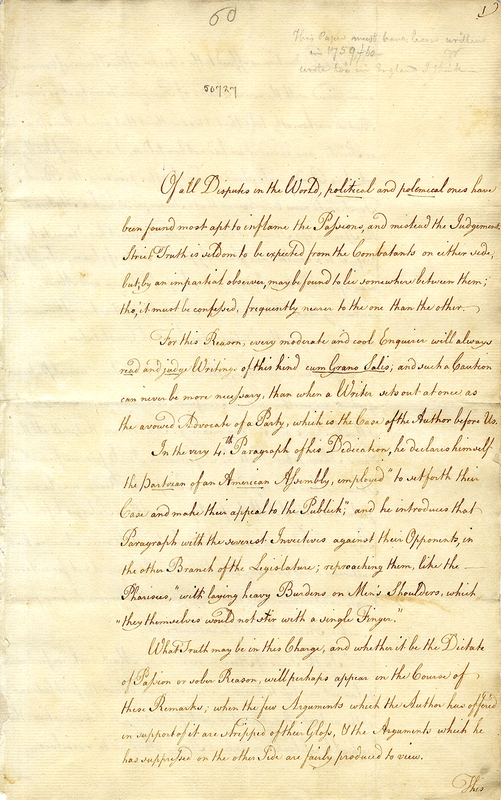 Thomas Barton to Richard Peters, 11 April 1758, Peters Papers, 3:377, Historical Society of Pennsylvania. Thomas Barton to Richard Peters, 18 July 1758, Peters Papers, 3:452, Historical Society of Pennsylvania. Thomas Barton to Sir William Johnson, "supposed May 1768," Documentary History of New York, 4:382. Thomas Barton to the Secretary, 8 November 1756, S.P.G. Letter Books, Series B, vol. 21, no. 1. Thomas Barton to the Secretary, 6 December 1760, S.P.G. Letter Books, Series B, vol. 21, no. 8. Thomas Barton to the Secretary, 28 June 1763, S.P.G. Letter Books, Series B, vol. 21, no. 13. Thomas Barton to the Secretary, 16 November 1764, S.P.G. Letter Books, Series B., vol. 21, no. 14. Thomas Barton to the Secretary, 23 January 1766, Historical Collections Relating to the American Colonial Church, William S. Perry, ed., vol. 2: Pennsylvania (Hartford. Conn., 1871), 400. Thomas Barton to Thomas Penn, 28 February 1757, Penn Papers, Official Correspondence, 8:239, Historical Society of Pennsylvania. Thomas Barton to Thomas Penn, 7 April 1758, Penn Papers, Official Correspondence, 9:21, , Historical Society of Pennsylvania. Thomas Barton to William Smith, 28 October 1755, the Hawks Manuscript Collection, Records of the General Convention, Archives of the Episcopal Church, U.S.A., S,I,19-6-58. 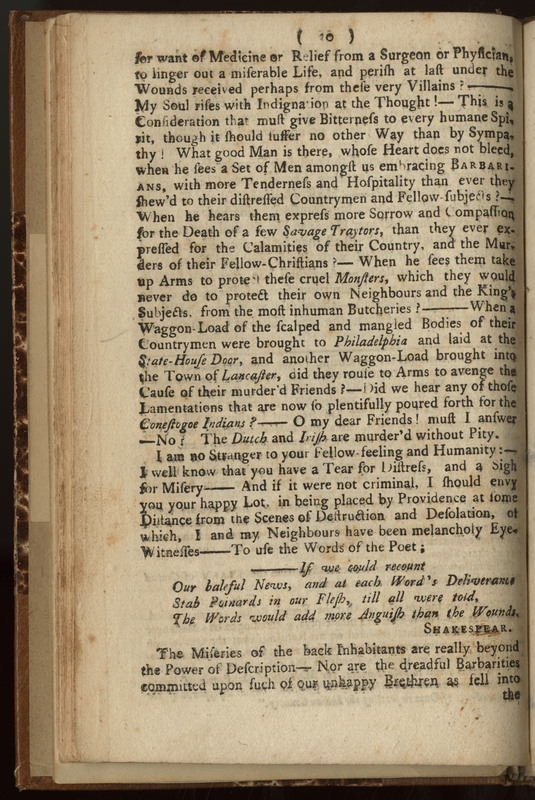 Thomas Barton to William Smith, 2 November 1755, Historical Collections Relating to the American Colonial Church, William S. Perry, ed., vol. 2: Pennsylvania (Hartford. Conn., 1871), 559.